New Regalia support that includes a brand new starter. AUTO (RC) When this unit attacks a vanguard, you may have this unit get Power+2000 until the end of the battle. If you do, at the end of the battle, put this unit into your soul. 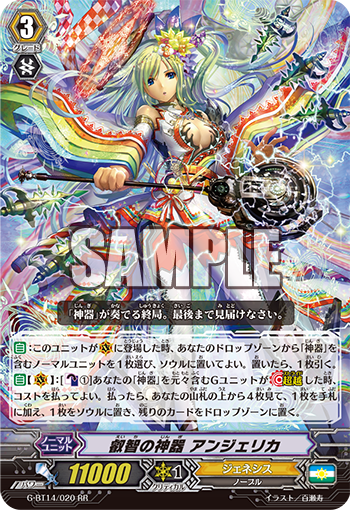 AUTO Generation Break 1 During your turn, when this card is put into the drop zone from your soul, choose a unit with “Regalia” in its card name, and it gets Power+3000 until the end of the turn. 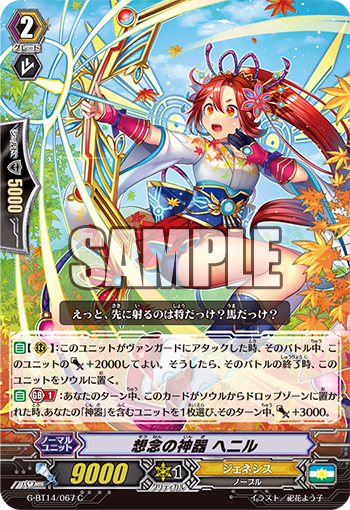 ACT (RC) [Counter Blast 1, and put this card into your soul] Reveal the top three cards of your deck, put up to one among them into your soul, put the rest into your drop zone, and if the card put into your soul has “Regalia” in its card name, draw a card.